CHI St. Luke’s Health Memorial Livingston Lab Receives Worldwide Accreditation, LIVINGSTON, September 9, 2014 - CHI St. Luke’s Health Memorial Livingston Laboratory once again met all applicable standards for accreditation through the College of American Pathologists’ Laboratory Accreditation Program. The Laboratory Accreditation Program is an internationally recognized program which includes complex university medical centers to physician office laboratories. It is designed to go well beyond regulatory compliance, and the program provides a solid foundation for excellence and quality practices in medical laboratories. Under the direction of Dr. David L. Todd, the Livingston laboratory is one of 7,000 CAP accredited facilities worldwide. The lab has been accredited since 2005 through the CAP program. During the accreditation process, inspectors examine the laboratory’s records and quality control procedures for the past two years. During an onsite investigation, CAP inspectors also examine laboratory staff qualifications, equipment, facilities, safety programs and records and overall management to assess the quality of the laboratory. The standards set by CAP are translated into detailed checklist requirements that the lab must follow. The checklists, which are specific to individual laboratories, constantly evolve to reflect changes in technology requiring continuous compliance. The CAP program advocates excellence in the practice of pathology and laboratory medicine worldwide. During the next two years, CAP will assist the Livingston lab in maintaining compliance. The CHI St. Luke’s Health lab will seek accreditation again in April 2016. CHI St. Luke’s Health Memorial Livingston Laboratory once again met all applicable standards for accreditation through the College of American Pathologists’ Laboratory Accreditation Program. 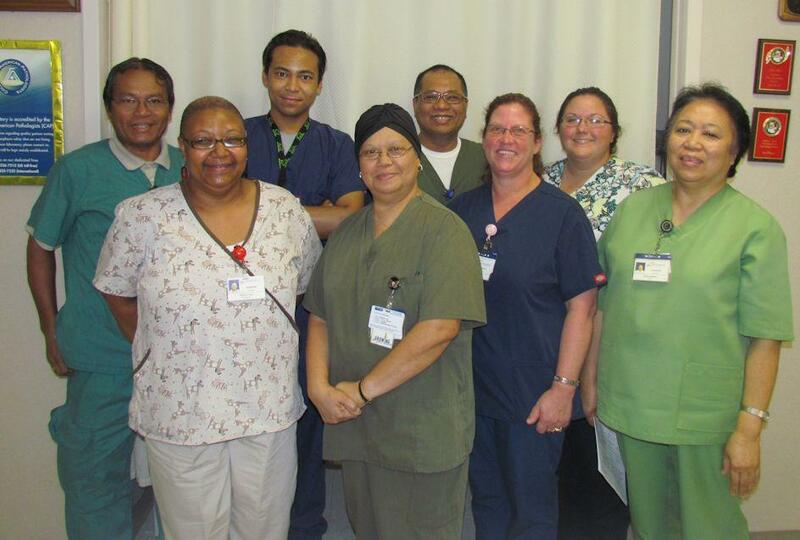 Pictured from left to right: (front row) Felicia Cole, Phlebotomist II; Rosalina Raul, Medical Technologist; Emily McCauley, Med Lab Tech; Edna Almirol, Director of Laboratory Services. (Back row) Romeo Camitoc, Med Lab Tech; Robert Silveri, Medical Technologist; Felipe Segundo, Lead Medical Technologist; and Brittany Puckett, Phlebotomist II. Not pictured: Kimberley Beck, Phlebotomist II; Lorna Gibbons, Phlebotomist II; Kendra Harden-Norman, Phlebotomist II; Jan Pate, Laboratory Technician; Danny Perez, Phlebotomist II; Bonnie Sanders, Medical Technologist; Wesley Smith, Laboratory Technician; Maree France Supnet, Medical Technologist; and Maria Yu, Medical Technologist.